This week we are challenging you to use white or ivory and your choice of one other color in your card design. I had such a blast creating my card this week. I was able to incorporate lots of things I love like, bling, glitter, and beads! I started with a 5.5 x 5.5 card base made from Calypso Coral. To that I added a smaller square panel of Whisper White. On the left side I added a strip of double sided Tacky Tape and then sprinkled on some Stampin' Up! ® Stampin Glitter. I stamped my Daffodil Corner and then colored it up with Copic Markers. Then I fussy-cut it out and adhered it to a lacy circle of Calypso Coral. Using an EK Success border punch I created a diamond border to which I added another strip of Tacky Tape and then covered it with seed beads. 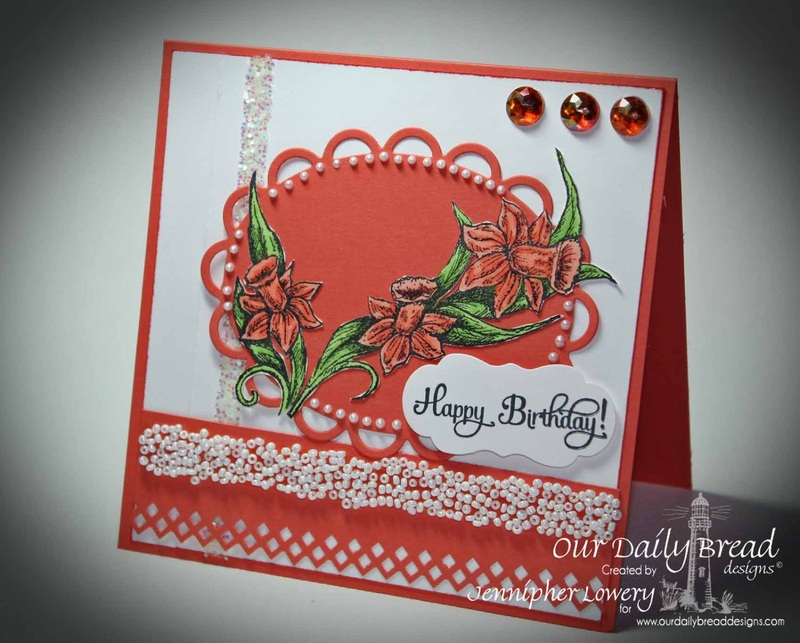 After I had my sentiment adhered to the card and the coral bling in the upper right hand corner, I went back in with my Viva Decor Pearl Pen and added some white pearl drops to the lacy circle. I hope that you will join us in our challenge this week. To make the challenge even more fun, we will be giving out a prize, a $15 gift certificate to be used toward stamps at the Our Daily Bread Designs store!! Entries for the prize must be submitted by Sunday, July 21 at 8 p.m. EST. One random winner will be chosen and announced next challenge. In order to win this prize, you do not need to use ODBD stamps, but if you have them, we would love to see them!! As a way of recognizing those who do use Our Daily Bread Designs stamps, we will again be choosing three or more of our participants for the Shining the Light Award. In order to qualify for this award, however, you must have your submission added to Mr. Linky by Sunday, July 21, at 8 p.m. EST. 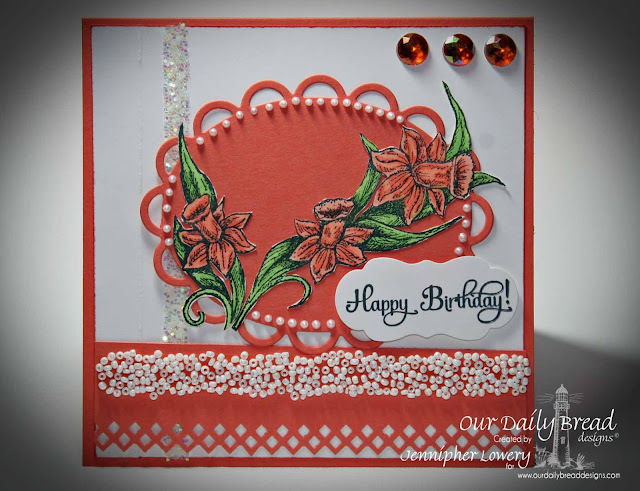 If you upload your creations to Splitcoast Stampers or any other online gallery, please use the keyword ODBDSLC162. When creating your posts on blogs please include a link to the challenge. What a stunning card Jennipher!! I just love your use of colors and all the elegant details. All of them add such elegance, dimension and interest. Beautiful! Oh, Jennipher, it's a beautiful card! I love the colors and great layout! Your use of the beads is lovely! Perfection! This is beautiful!! I love the fussy cut flowers on the lacy oval!! Absolutely beautiful! I love all of the pearls! So pretty with all those pearls! the colors you used are just gorgeous!! great job!! That is so beautiful. Those embellishments are perfect and I adore the colour scheme.